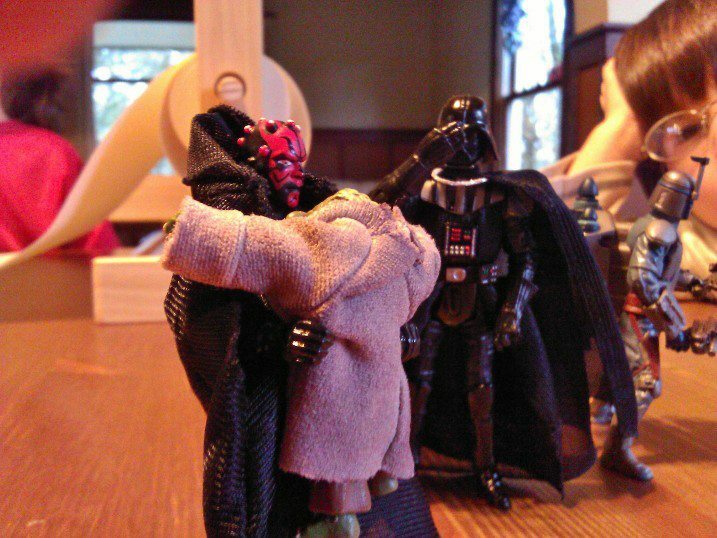 Maul and Yoda hug it out. I took my oldest son to Target the other day where he bought his first Star Wars action figures. Yoda, Darth Vader, and Darth Maul. He’s got good taste, this kid. I thought I remembered how wonderful childhood was. I was wrong. I realized how much I’d forgotten when I witnessed the joy on his face and in everything he’s done since we picked them up. From gazing longingly at the boxes all the way home in the car, to tearing them open at home and playing with all the accessories. He went to bed terribly late that night because he had to play with them. And I thought he would sleep in because of it, but no, he was up before everyone else in the house, asking me if I’d get up and play Star Wars with him before his sisters woke up. This entry was posted in Family and tagged darth vader, star wars action figures. Bookmark the permalink. I was the anti-Trekkie for far too long, all because of Star Wars. I didn’t see a Star Trek movie until Star Trek VI hit HBO. And then I kicked myself for never giving it a shot. Needless to say I had a lot of very happy catching up to do.